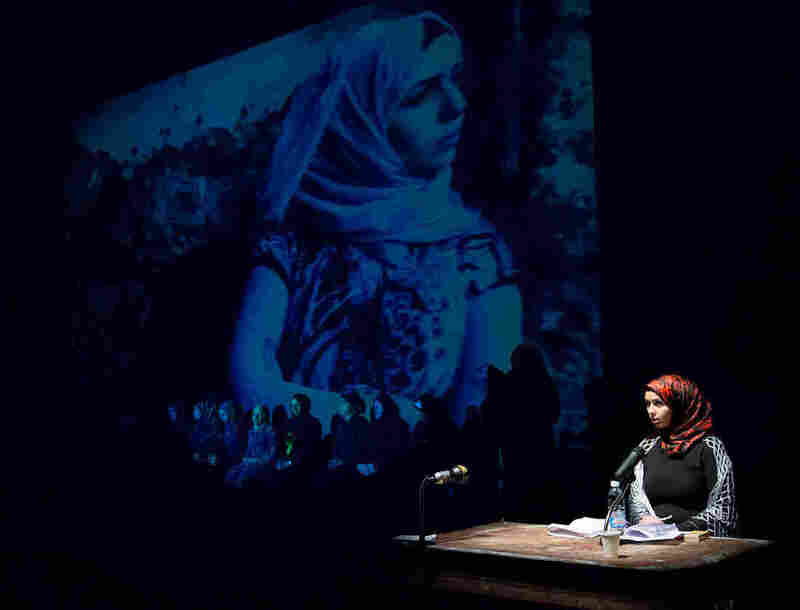 Syrian Women Displaced By War Make Tragedy Of 'Antigone' Their Own : Parallels Sophocles' ancient Greek play chronicled a princess' plight after a horrible civil war 2,000 years ago. Syrian refugee women in Beirut are incorporating their lives into a new production of the drama. Barefoot in a yoga studio in Lebanon's capital Beirut, a couple dozen actresses raise voices and stretch bodies that had grown used to being quiet and still. "Go on," they cry as a clapping exercise speeds up, and they fill the room with whoops and uninhibited yells. But these women aren't professional actresses. In fact, they're refugees from Syria, and this production of the Greek tragedy Antigone is a project designed to help them deal with their trauma. "The play Antigone was an opportunity for us to voice everything inside of us," says one woman, Wisam Succari. "It's a story which takes place in the context of a war and we, too, as Syrians, have fled a war." We were not born just to listen, just to obey, just to receive orders. We should be able to stand up for something in our lives. Antigone was written by Sophocles more than 2,000 years ago about mythical wars in what is now Greece — but the organizers of the project see many parallels with Syria. At the opening of the play we meet Antigone, a princess, in the aftermath of a horrible civil war in which both her brothers died. One brother was on the winning side and is buried with honors. The other was on the losing side and the new king decrees he'll rot, unburied. Antigone is outraged: She sees this as being against all the laws of decency and buries him herself, even though she knows that means the king will kill her, too, which he does. The dilemma of whether to do the right thing, even if it's self-destructive, seems to speak to these women, who saw a peaceful uprising met with force and turned into a multi-polar war that consumed their country. Mona, 28, narrates during a rehearsal of Antigone. "I feel that Antigone resembles me a lot," says the former resident of Damascus and mother of two. 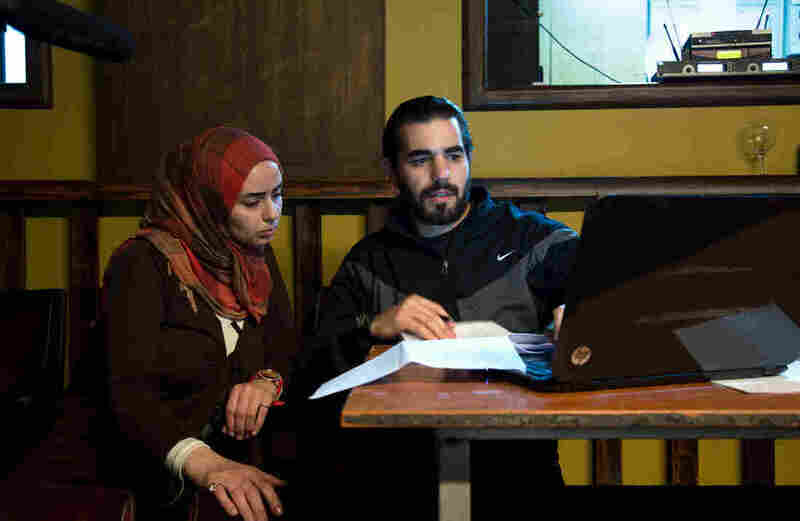 Syrian producer Itab Azzam worked to raise money — mainly from private donors — for the project. "It's actually about women taking control of their lives. Antigone's not a victim." The women work with writers to incorporate their own experiences into the script. Many lost loved ones and now live in poverty. "I feel that Antigone resembles me a lot. A lot," says Mona, a 28-year-old mother of two, with wide expressive eyes and a floral headscarf. She lived in Damascus and watched her neighborhood rise up in rebellion. "We were not born just to listen, just to obey, just to receive orders," says Mona, who only gave one name. "We should be able to stand up for something in our lives." When men were rounded up by the regime or attacked by rival militias, women sometimes tried to defend them. Mona says many died to protect husbands and sons: "So Antigone reflects the situation of a lot of women in Syria." Still afraid of the regime, Mona doesn't want her last name used. She's lost everything, and lives in Beirut in a hovel and worries about how to feed her kids. But asked if charities should spend money on theater when there's so much poverty, she says yes, absolutely. "Our lives have drastically changed for the better," she says. Their psychological well-being has improved. Several say they feel alive again, more human. The first performance was earlier this week. Backstage, the actresses tried to steady their nerves, while also calming down their children. Plus, the project helped the women by paying them for their work as actresses and providing childcare for them during rehearsals. The lights dim and Mona takes the sparse stage for a monologue weaving her life with Antigone's story. Would the princess have defied the king if she'd had kids? Would it have been different if she'd been a commoner? "We are not princesses," she says in a clear, light voice with more pathos than self-pity. "No one knows of us and no one would speak of us if we died. Even in death, there are lucky people." Mona goes on to say she now feels Antigone with her when she's cooking and cleaning, even in her dreams. Sometimes she feels brave and defiant like the tragic heroine, even if at other moments — like when she's harassed on the street by men — she is timorous and silent. Opening night goes well. The women celebrate. "I want to kiss everyone!" cries Mona. Out front, the audience is left thinking. "I'm still a little bit in shock," says James Sadri, an activist on Syria issues. "It was a very emotional play." Sadri knows all about Syria, but having the refugees in front of him, he says, "there is nothing more powerful than that, than drilling really to the core of your heart and the tragedy of what's happening in Syria." In the Sophocles play, the king remains in power — but broken and sorrowful. In the final lines, the chorus says that great words of proud men are always punished in the end. Alison Meuse contributed to this report.